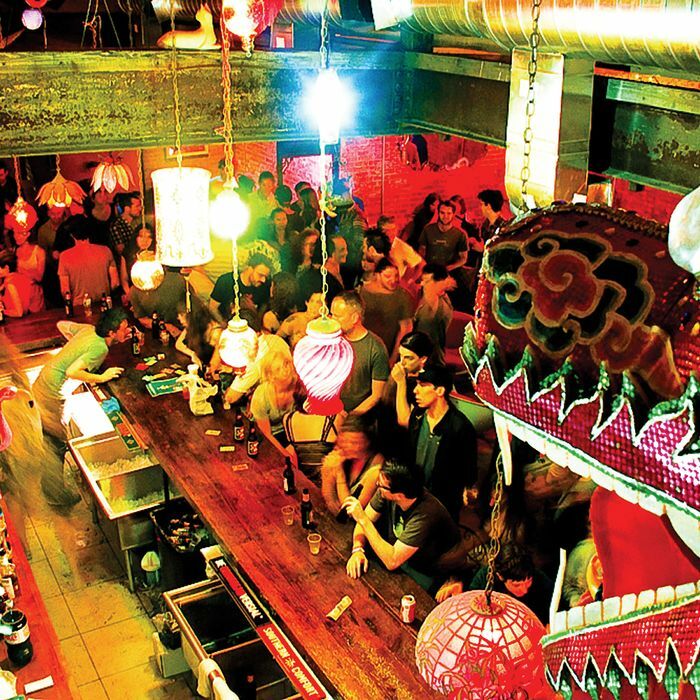 a grittier vibe, with graffitied walls, subway seats, and a dubstep-and-jungle soundtrack. 205 Chrystie St., at Stanton St.; CBU: 19 Stanton St., at Chrystie St.; 212-673-2400; late Aug.
“It’s like Moulin Rouge, distressed and on acid,” says the team behind this 160-capacity bar and underground concert space, located in a former air-conditioning factory. The modus operandi here is DIY, from the hand-built stage and found furnishings to the whimsically infused spirits. Since starting top-down renovations last fall, the founding partners—all late of Pianos on the Lower East Side—have hosted the odd show and birthday party (including one for Amazing Baby’s Will Roan last week), but can’t officially bow till they get one last red-tape signature. Look out when they do, though—this is not the kind of place you’ll leave before morning. 1031 Grand St., nr. Vandervoort Ave., Bushwick; 718-218-7871; early Sept.
For Europhiles with a Twitter feed comes a bounty of tufted banquettes, wood paneling, and a rose-petal ceiling, all designed by Gregory Okshteyn, the visionary behind the Kardashians’ Dash boutique. House cocktails are still in development, but we suspect they’ll mostly be pink. 5 E. 19th St., nr. Broadway; 646-368-8427; mid-Sept. The deft hand of Sam Anderson (Hotel Delmano, Freemans) can be seen all over the pod 39 capsule hotel’s rooftop bar. The seventeenth-floor space boasts views of the Chrysler Building, rowdy-making drinks (try the Sonora Old-Fashioned, heavy on the bacanora), and a raring-to-go international party crowd. 145 E. 39th St., nr. Lexington Ave.; 212-355-0300; mid-Sept. Details are scant, but here’s what the latest from Alchemy Consulting’s Troy Sidle will not be: “a speakeasy, neo-speakeasy, or any kind of twenties throwback.” Sidle, who has parterned with Death & Co.’s Joaquín Simó and two others, says the 88-seat bar will serve exactingly simple cocktails, and a controlled door means you’ll always get a seat. 225 Ave. B, nr. 13th St., second fl. ; mid-Sept.
Drinkmaster Del Pedro knows a thing or two about cocktail history, having tended bar at Pegu Club and the dearly departed Grange Hall. Now he’s bringing his chops to this faux-twenties haunt, inspired by Chicago’s Dil Pickle Club. Expect cocktails aplenty, plus a “bitters, barrels, and beer” menu. 793 Washington Ave., nr. Lincoln Pl., Prospect Heights; 347-955-4743; mid-Sept.
Named after the 1949 movie, the 44-seat project from the team behind Seasonal and Edi & the Wolf has the same “egalitarian” feel of rustic-casual Edi, but zeros in on “chef-inspired cocktails” like the Secession (gin, watermelon juice, lime, and salt), plus Austrian small plates. 116 Ave. C, at 8th St.; mid-Oct. Think of it as an immersion experience from the partners behind SL and Abe and Arthur’s: 20,000 square feet of restaurant and nightclub, spread over two floors, in the space once belonging to Crash Mansion. The club is the crown jewel, draped ceiling to floor in blue velvet with a mega sound system, video wall, rosewood-and-chrome bar, and, allegedly, the programming expertise of Red Egg’s Travis Bass. 199 Bowery, at Spring St.; 212-627-1235; late Oct. When Milk & Honey moves to 23rd and Madison this fall, its star bartenders Sam Ross and Michael McIlroy will stay behind to sling drinks in their characteristic menuless style—only this time they’ll be the owners. Other changes are also afoot, including an expanded space, more whiskey and amari, and a refreshing no-reservations policy. 134 Eldridge St., nr. Broome St.; late Nov. The mini-chain that revolutionized dinner-and-a-movie in Austin lands in New York, with an UWS location planned for 2013. Seats have tables in front of them, à la Williamsburg’s Nitehawk, where servers adept at ducking drop off beer, wine, and comfort food. Specials often correspond to new releases, many of them indie and repertory. 2500 Central Park Ave., Yonkers; mid-Dec.
Rock ‘n’ roll is the word here, from the stylish black-and-white interior to the owners’ own musical backgrounds. The two-room spot has curving banquettes, a glossy-dark thirties bar, a D.J. Booth, eight taps, and an unfussy roster of cocktails emphasizing local and small-batch spirits. 162-164 Ave B., at 11th St., 212-529-8463; open now. This story appeared in the August 27, 2012 issue of New York Magazine.